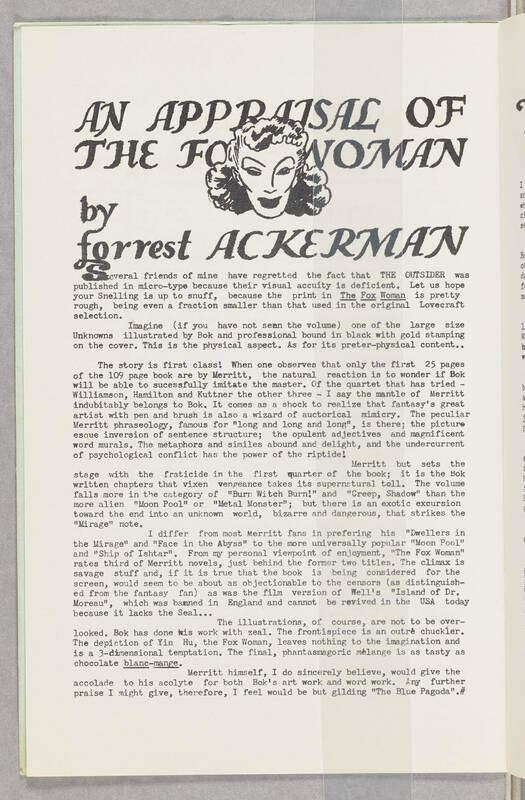 An Appraisal of the Fox Woman by Forrest ACKERMAN Several friends of mine have regretted the fact that THE OUTSIDER was published in micro-type because their visual accuity is deficient. Let us hope your Snelling is up to snuff, because the print in The Fox Woman is pretty rough, being even a fraction smaller than that used in the original Lovecraft selection. Imagine (if you have not seen the volume) one of the large size Unknowns illustrated by Bok and professional bound in black with gold stamping on the cover. This is physical aspect. As for its preter-physical content.. The story is first class! When one observes that only the first 25 pages of the 109 page book are by Merritt, the natural reaction is to wonder if Bok will be able to sucessfully imitate the master. Of the quartet that has tried - Williamson, Hamilton and Kuttner the other three - I say the mantle os Merritt indubitably belongs to Bok. It comes as a shock to realize that fantasy's great artist with pen and brush is also a wizard os auctorical mimicry. The peculiar Merritt phraseology, famous for "long and long and long", is there; the picture esoue inversion of sentence structure; the opulent adjectives and magnificent word murals. The metaphors and similes abound and delight, and the undercurrent of psychological conflict has the power of the riptide! Merritt but sets the stage with the fraticide in the first quarter of the book; it is the Bok written chapters that vixen vengeande takes its supernatural toll. The volume falls more in the category of "Burn Witch Burn!" and "Creep, Shadow" than the more alien "Moon Pool" or "Metal Monster"; but there is an exotic excursion toward the end into an unknown world, bizarre and dangerous, that strikes the "Mirage" note. I differ from most Merrit fans in prefering his "Dwellers in the Mirage" and "Face in the Abyss" to the more universally popular "Moon Pool" and "Ship of Ishtar". From my personal viewpoint of enjoyment, "The Fox Woman" rates third of Merritt novels, just behind the former two titles. The climax is savage stuff and, if it is true that the book is being considered for the screen, would seem to be about as objectionable to the censors (as distinguished from the fantasy fan) as was the film version of Well's "Island of Dr. Moreau", wich was banned in England and cannot be revived in the USA today because it lacks the Seal... The illustrations, of course, are not to be over-looked. Bok has done his work with zeal. The frontispiece is an outre chuckler. The depiction of Yin Hu, the Fox Woman, leaves nothing to the imagination and is a 3-dimensional temptation. The final, phantasmagoric melange is as tasty as chocolate blanc-mange. Merrit himself, I do sincerely believe, would give the accolade to his acolyte for both Bok's art work and word work. Any further praise I might give, therefore, I feel would be but gilding "The Blue Pagoda".